IHG® Rewards Club - Music - H.B. Barnum - The Big Voice Of Barnum - H.B. That Is! 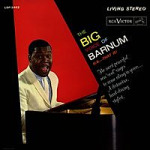 The Big Voice Of Barnum - H.B. That Is!